So why am I going on about the various political conflicts during the seventeenth century? Well a number of reasons, and it might be useful to go through them, so you understand what I'm about, as well as how what I'm about influences my work. It's interesting. Now, this is largely subjective. Usually, when people talk about why they don't like history, they mention "memorizing dates". People learn sports stats, the details of who wrote a favorite song and under what circumstances, or how to roast a goose. To think productively about something, you have to know something about it. Yes, I know this is probably an unpopular and even problematic attitude nowadays. Nevertheless, it remains true.I happen to enjoy learning about the actions and misbehaviors of influential or interesting people of the past, and the characters of 17th century England were certainly interesting. To celebrate, I just put on Edward German's "Nell Gwyn Overture", a cute piece of incidental music from 1900. Let not poor Nelly starve--if she could have gotten royalties from her future fame, Charles would not have had to make this plea to his brother James on his deathbed. It tells us a lot about the origins of our political system. Yeah, I know. That sounds a bit too wholesome and improving. Still, it really is fascinating to try to inhabit the mental world of people who don't know that someday there will be filibusters and primaries. Now, yes, a narrative of steady progress toward freedom is not tenable. But still, it is startling how every attempt to reassert Royal prerogative was successfully opposed, sometimes with violence, sometimes with Parliamentary maneuverings. People recognized rights, and defended them. Reading their arguments, seeing their positions, and understanding their ambitions, shows us what is functional in a political system, and what isn't. It reflects our own time, sometimes in disturbing ways. This is what struck me the most as I read the book. The Stuart century starts with a fairly ordinary royal administration under James I. Then it falls apart into brutal civil war and ends in a military dictatorship. The large-scale collapse of civil government, leading the widespread violence and death, in a country not threatened from outside, is quite disturbing, though it did come in the middle of a century that seemed devoted to senseless ideologically and theologically driven violence. In England ideology and interest overwhelmed a sense of common nationhood. And, after all that, no one had a working government model to replace the one that had been destroyed. A military dictatorship ensued, but only because they had a supernaturally skilled military and political leader, Oliver Cromwell, to be military dictator. And he never came up with a system that would go of itself. Once he died, they had no choice but to return to the royal system they had so violently destroyed. But once you've killed a King, and run things pretty successfully without one for awhile, can a King ever feel completely secure? The body politic under Charles II was disordered, violent, moody, and more than a little deranged. And their King and his brother, the heir, were both in the pay of the King of France. Patriotism doesn't pay the bills after all. So vast conspiracy theories convulsed the nation, leading to riots and executions. Our petty Vince Fosters and Seth Riches have nothing on Edmund Berry Godfrey lying in a ditch on Primrose hill, impaled on his own sword, or the attempted assassination of both the King and his successor. When the next crisis came, a major part of the ruling clique invited a foreigner to come in and replace their legal monarch, and then just brazened it out: "I really don't get what you're going on about". We call this coup the Glorious Revolution, and, in fact, its somewhat low origins do not prevent this new period from being the fount of much of our thinking on the legitimacy of democratic government. Then, safe at last, everyone, or at least everyone with the leisure to indulge themselves, sank into childish and vicious party rivalries over issues of little ultimate significance. That's the happy ending! Thomas Hobbes lived from 1588 (when his mother was supposedly frightened into labor by news of the approach of the Armada) to 1679. Someone similarly long lived born in 1625, the year Charles I became King, would have lived to 1716, two years into the reign of George I, the first Hanoverian monarch. King Charles would have been executed when they were 24, Cromwell become Lord Protector when they were 28, Charles II King when they were 36, and the Glorious Revolution when they were 63. Someone who lived in interesting times. Do you think you'll see anything like that amount of political change over your life? For all its flaws, our system has been remarkably stable. What are the chances that that will continue? 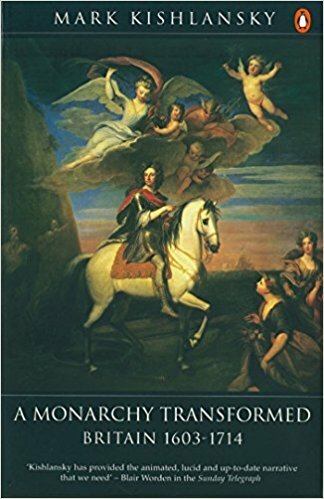 I recently read A Monarchy Transformed, Britain 1603-1714, by Mark Kishlansky. It's part of The Penguin History of Britain series. The book is from 1996, and it looks like the series is getting a refresh. I don't know if there will be a new edition of this book, however, since Prof. Kishlansky died a few years ago. I quite enjoyed it. It's almost entirely a political history of the Stuart century, from the accession of James I (and VI of Scotland) to the death of Anne. Don't read it for insights into the literature, architecture, or science of the time, interesting though all of those were. Kishlansky barely mentions any of them. Religion does get covered, mostly because of its strong influence on politics. But I was actually reading it for the politics. I'm interested in the nature of political legitimacy, when people accept it, and when they reject it--and the Stuart period has multiple collapses of legitimacy. I'm apprehensive of our own time, and want to see how other eras handled it and what the consequences were. I see four periods during the Stuart century that can provide us with some ways to view our own time: The English Civil War, the two great conspiracy panics of Charles II's reign (the Popish Plot and the Rye House Plot), the Glorious Revolution where some rich people used the panic of the population to dethrone their legitimate monarch and invite the ruler of a frequently hostile foreign power to take over the position instead, and the savage beginnings of recognizably modern party conflict during the reign of Anne. The Stuarts were frequently annoying and usually infuriating, but they were never dull. The biggest one comes first: the English Civil War. I've always been interested in the English Civil War, the most violent of these collapses of legitimacy, but I've never really understood it. I read A Monarchy Transformed to read about it in the context of its entire era. I do understand it a bit better, but I now know it's going to be a long road. James I took over a kingdom where the incumbent, Elizabeth I, had been kicking the can down the road for decades.It was like inheriting a vehicle whose frugal previous owner had not done any maintenance, never changed the oil, and bribes the inspector at emissions testing time as cheaper than doing the necessary work. So James had trouble with financing, as did his son Charles I after him. Not that their notoriously expensive art-collecting lifestyles didn't contribute. It isn't hard to imagine a monarch who did a better job managing Parliament, wars, the Scots, the Irish, and religious strife better than Charles I. But it is hard to imagine one who comes through the crisis unscathed. Civil wars are the most brutal of wars. Then the victors killed the King, because he really was just so damn annoying there really wasn't much else they could do. I'm sure most of them knew it was a bad idea, but Jesus, what a pompous jerk. Even the fact that both he and his sidekick Archbishop Laud were both really short, around my height, doesn't make me sympathize with either of them. OK, he's dead. Now what? But then what? Between various Parliamentary factions, religious groups, and the Army, there was constant mistrust, hostility, and conflict. Eventually a charismatic leader, Oliver Cromwell, became dictator and turned England into a successful bully that punched way above its weight in European affairs. But neither he nor Parliament ever created a functioning political system to replace the previous one, so when he died, there was nothing to do but ask Charles's son, Charles II, to come back and pretend nothing much had happened. Successful Truth and Reconciliation efforts require a small bit of Truth and a whole lot of Reconciliation, ignoring a lot of past bad behavior until everyone involved is dead, and this one was surprisingly successful. But why did everyone start killing each other in the first place? But it's hard to really see the hostility that led to the death of seven percent of the population in a few short years (something like 22.5 million dead in a proportional conflict in the United States in 2018, if you want a cheery number). Oh, you read about squabbles about altar rails and ship money and Catholicism, but that seems like the usual incomprehensible issues people in the past seemed to get so exercised about. But under all that was clearly a lot of rage. Of course, it might be that the islanders were just getting competitive with the Continent, where the Thirty Years War had become the bloodiest European conflict before the Twentieth Century. Keeping up with the Hapsburgs, and all that. After an earlier squabble with Parliament, Charles I dismissed it and ruled on his own for the next eleven years, the period of Personal Rule (or the Eleven Years' Tyranny, if you want to be a sorehead about it). Things actually looked OK. Harvests were good and there were no big disasters, so it seemed to be working. But underneath the surface the finances were just not adding up. And there was no way to raise taxes without Parliament. Afterward, people probably looked back at this period with longing, thinking about how good life had been, even as the foundations had slowly collapsed. So a halcyon period can conceal the rot that causes its structure to collapse. And this particular collapse was horrendous. I think it was worse than our own Civil War...but maybe more like any future civil war we might have. No one in the future will really understand what we were fighting about either. I'm not sure I do, and I live right here. Will we feel lucky if we get our own Cromwell? Why does everyone think that if we get rid of our clunky, old-school political system, we can agree on a shiny, efficient new one? Next time: Conspiracy theories and more conspiracy theories. OK, Plots.